China Cultural Exchange trips started in 2006. The first school in China that we established friendship was Guangzhou 109 School. Our student groups visited them a couple of times in the past decade and gained wonderful experiences in the cultural exchange. The current friendship school fot our cultural exchange programme is Greentown Yuhua School which is located in Hangzhou, southeast of China. The programme involves spending time with our friendship school students and teachers, participating in a variety of activities which include attending various interesting craft and cultural lessons, spending time with our most generous host families and going on field trips around Hangzhou city. The trip concludes with 10 days travelling around China to cultural and historical areas of interest such as Shanghai, Suzhou and Beijing. The exchange stimulates and benefits learners of both Chinese and English, allowing the respective exchange students and teachers to share their cultural, linguistic and professional skills and enhance academic standards and cultural knowledge. It is our turn to welcome and host students and staff from the school we visit every second year. We hope you enjoy your visit, in partivular catching up with our students whom you met last year. Testing the water on the North Shore! Nikki Singh, Year 12, reports on the trip to China..
19 students, Mr Prasad, Mrs Prasad and Mrs Fang made up the group who travelled from New Zealand to China on the 2014 Greentown Yuhua exchange. We didn’t realise how 18 days was all that was needed to change our lives for the better. After 12 hours and 15min of sitting in a plane we arrived at our first destination: Shanghai China. The next four days in Shanghai were jam packed with activities such as visiting the World Financial Trade Centre (which is 100 floors high and the highest tower in the world), watching Chinese acrobats, visiting various temples, going to the Nanjing Road shopping street and riding in a bullet train that travelled at up to 433kmph. Nanjing shopping street was maybe the biggest surprise for all of us. In our minds we imagined a small run down road with little donkey pulled carts that sold handmade merchandise. Nanjing shopping street was however the equivalent of walking down Auckland city in the night time. Shops ranged from beauty products like Chanel to clothing stores like Converse and Prada.. Our time in Shanghai disappeared with the wind and before we knew it we were sitting in a bus for 2 hours heading to Suzhou. Suzhou was a beautiful city but we only had two nights there. The only sight-seeing we were able to do was visit the Humble Administrator’s Garden which is the largest garden in Suzhou and the finest garden in all of Southern China. Most of the students didn’t want to leave our 5 star hotel in Suzhou but we had to because the most important part of our trip was coming up: our school exchange. Going to Hangzhou all of us had the same thought running through our brains ... "What if we didn’t get along with our homestays?”... When we arrived at Greentown we were greeted with a massive signboard that said "Welcome friends from Lynfield College New Zealand”. We all started to talk at once as excitement began coursing through our veins. The school itself was breath-taking! With 3 cafeterias, a giant all weather athletic track the size of Mt Smart Stadium, gyms, student dormitories, an archery centre and many different types of classrooms, Greentown Yuhua was a lot for most of us to take in, it was massive to say the least. Seeing the friendly faces of our homestays set us all at ease from our earlier thoughts and we were all able to fit in with the students from Greentown Yuhua. School started at 7:30am and finished at 5:0 pm Monday to Friday. Such an early start meant that Lynfield College students had to wake up at at least 5:30-6:00am each day. The students of Greentown Yuhua have 9 periods a day which means they have to sit through at least 9 hours of school and only have one break for lunch throughout the entire school day. Soon Lynfield College students were trying to get their sleep whenever they could! Our homestays treated us like gold! Some students went to ice-skating with their homestays, others went shopping at massive malls and others would go to amusements parks. The homestays completely spoiled us. When it was time for us to leave to go to Beijing we were all tearful because the homestays had become like family to us .Tearful farewells were wished and emails were exchanged so that none of us would lose touch with each other. The final leg of our journey had arrived. Travelling in overnight train was another story in itself! With two bunk beds and 4 students per room we all had to find ways to stow away our luggage without blocking our walking area and squeezing ourselves onto thin beds. But we all had fun and arrived in Beijing ready to take on the world! Beijing consisted mostly of sightseeing and buying last minute present for people back home. We went to see the Great Wall of China and climbed it for 1 hour. We saw the Forbidden City, Silk Street Market, Wangfujing Snack Street and the Summer Palace. And before we knew it our 18 days were up. We were sad going home because we knew that we would miss the friends that we had made along the way but we started to takea look at our life in New Zealand from a new perspective (such as appreciating the fresh air) Ms Fang had told all of us before we left to open our minds, open our hands and open our hearts. That is what we did and we had the experience of a lifetime! 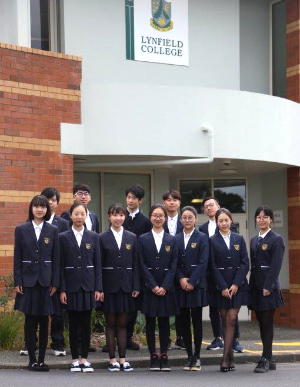 Students, staff and host families have welcomed a group of students from our friendship school, Greentown Yuhua School, from Hangzhou, China. Although this has been a visit of just a few days the students have managed to spend time in school, around Auckland landmarks and exploring the area around Muriwai beach. While in school on Monday the Chinese visitors spent time with our students in the Food Technology rooms preparing some Kiwi dishes for their lunch - pumpkin soup with garlic bread, mussel fritters and pavlova with kiwifruit. Then they experimented with their drawing skills in the Art department, with Ms Ankersmit introducing them to a special New Zealand motif - the koru, and guiding them through some design work based on this. The photos show the students busy cooking their lunch and then in the art room. 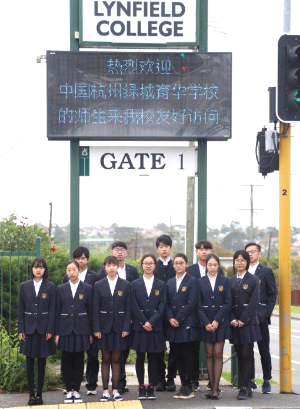 This year on the 31st March a group of 19 Lynfield college students, along with four students from Waitakere College, left for the Greentown Yuhua School exchange in China. The trip was led by Mr Aitken, Mr Welsh, Mrs Fang and Ms Smith. Over the course of 18 days, students were luck enough to participate in a range of activities where they could experience Chinese customs, traditions and cuisine. This included travelling to famous places such as Tian an Men Square, The Great Wall of China and The Forbidden City as well as taking part in Chinese cooking, taekwondo and tea ceremonies. Cities visited included Beijing, Hangzhou, Nanjing and Shanghai with the majority of time spent in Hangzhou. It was wonderful for students to form friendships with their host partners at Greentown Yuhua School and to get involved in the activities planned each day. “Our 16-day trip was completely eye-opening and an unforgettable experience for all of us. It was wonderful to be part of this exchange!” – Kate Cadzow, Year 13. 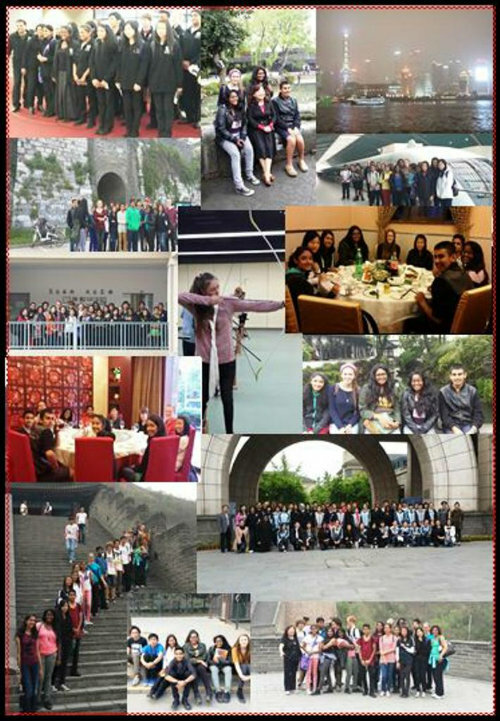 For 16 out of the 19 students who went on this trip, China was a completely new and exhilarating experience. For the other three it was simply exhilarating as they had already been to China before. Shangahai and Beijing offered up some special and spectacular experiences, but the majority of the time was spent in Hangzhou where Greentown Yuhua School hosted the Lynfield students. Homestaying with Chinese families, starting lessons at school at 7.30am,being in a school with 300 students and two full athletic tracks (as well as music halls and auditoriums), having a picnic in the Xixi wetlands, and staying the last night in the school’s accommodation – all were memorable for different reasons.